Id like to thank SimPE people, Wes_h for his awesome plugin, WDSBrianna for her tutorial, And well everyone else who has made meshing for sims 2 possible. Oh and id like to thank everyone in the sims commuinty, Without you my whole desire to make meshes and be part of it all wouldnt be there. Please leave a comment in my guestbook!!! This mesh is called Up All Night. The mesh is a fuller high ponytail. BTW ive included 5 colors- Platinum Blonde, Blonde, Brown, Black and Red. Oh this is nice! thank you. It should work for Uni. I have downloaded meshes before I got Uni and all it seems to do is clone them for young adults. Nice work by the way. Brilliant! Fantastic! Thank you very much!!! #5 6th Jun 2005 at 5:33 PM Last edited by booba : 6th Jun 2005 at 6:09 PM. #7 6th Jun 2005 at 6:01 PM Last edited by JosephTheSim2k5 : 6th Jun 2005 at 6:04 PM. This is brilliant - taking a long time to download though. Its really cute, funky but sophisticated. Who said a Princess had to be beautiful? wooooooooooooooweeeeeeeeeeeehhhh FANTASTIC WORK!!! Well done!!! Thnx! nice mesh lola!! i d/led it at TSR earlier this morning...lol! still wanted to say thanks here! you do great work, keep it up! OWOWOWOWOW!!! hehe I Just LOVES IT!!! Fab. Job!!! 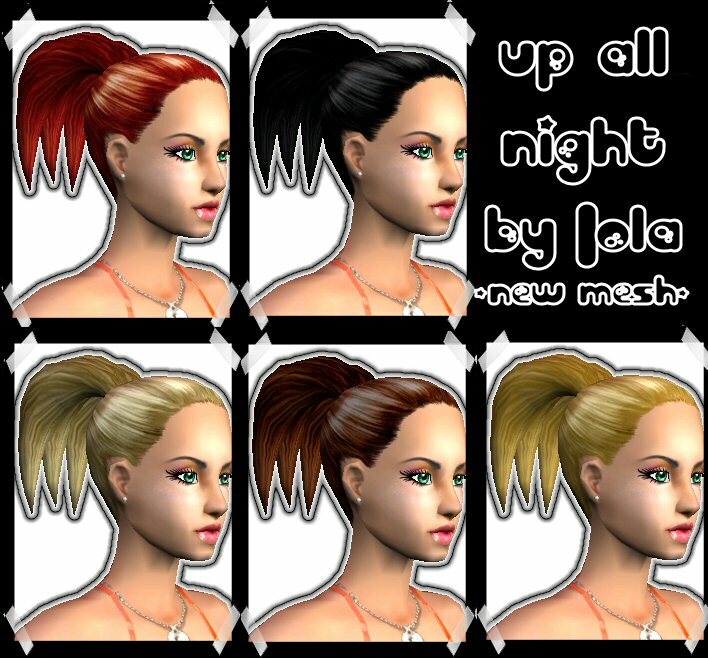 I e-mailed you a mesh hair request! my e-mail is [email protected] ! This is too fab Lovr tthis!! Thanks so much! I'm downloading it now, I can't wait to see how it looks in the game...looks great though! Wow your talented I love your creations.